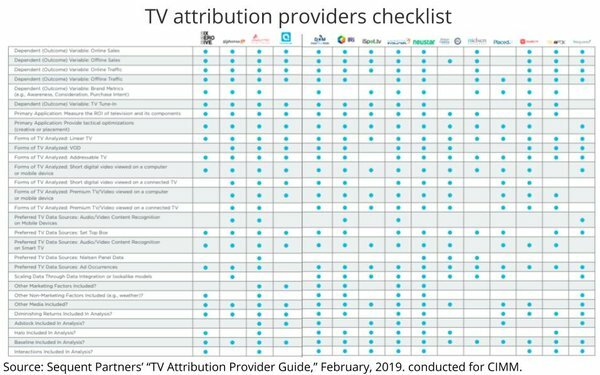 As a follow-up to a benchmark report profiling 15 television attribution providers, Sequent Partners this morning released a more in-depth report providing a detailed report card-like assessment of companies currently providing some form of TV attribution and/or marketing-mix modeling. The report, which was commissioned by CIMM and the American Association of Advertising Agencies (4As), will be presented at the 8th Annual CIMM Cross-Media Video Measurement & Data Summit in New York City today. As the report explains, attribution simply is the “science of allocating credit” to media that drive a marketing outcome, usually defined as sales, but occasionally some other KPI (key performance indicator). Modern day attribution modeling emerged first with digital media, because of the abundance of data available for tracking the end-to-end performance -- from exposure through action -- but as Sequent’s “TV Attribution Provider Guide 2019” notes, the proliferation of smart TV and set-top-box data has made it possible for providers to develop similar methods for modeling the effects of TV advertising exposure.